House-made pickled grapes with diced pineapple and mixed berries, blended with Hellmann’s® Grapefruit Ginger Splash Vinaigrette, yogurt and honey. Topped with gluten-free granola, cocoa nibs, basil and mint. 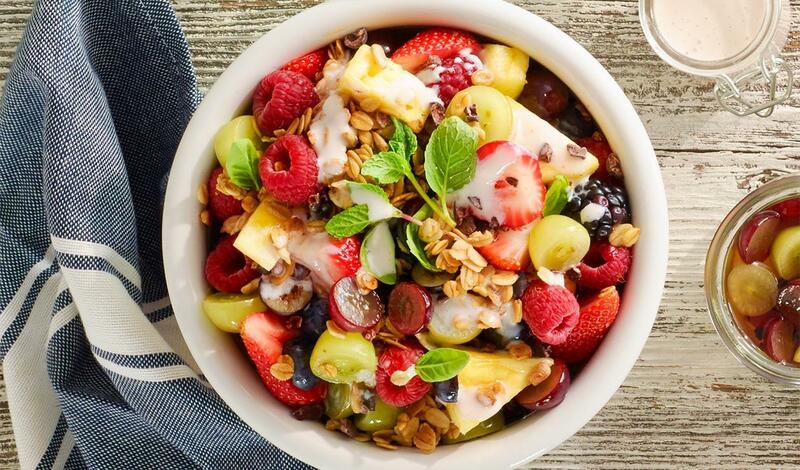 Combine the Creamy Grapefruit Dressing with the pineapple and mixed berries, top with remaining ingredients reserving herbs and cocoa nibs as garnish. Combine all ingredients except grapes and bring to a boil, stirring to dissolve salt and sugar. Pour over the grapes and allow to cool to room temperature. Allow to marinate overnight under refrigeration.